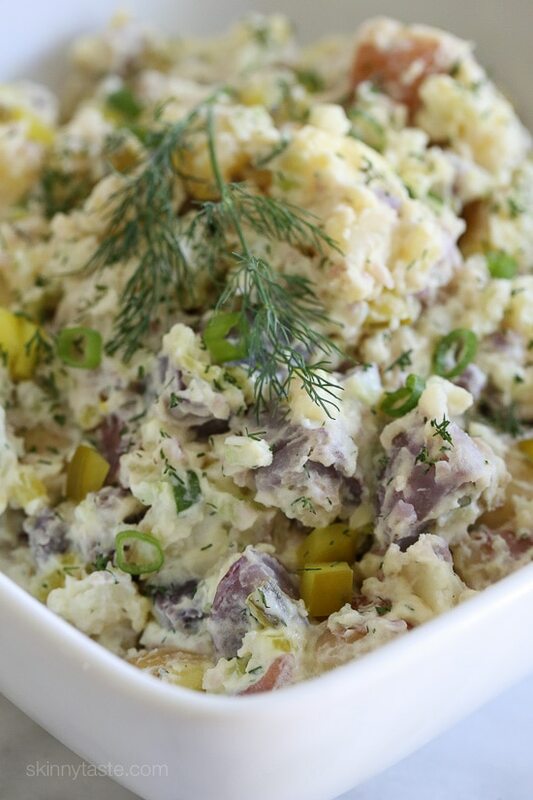 This creamy potato salad made with rainbow potatoes, celery, pickles, mustard and dill is lightened up using half mayonnaise, half yogurt. Perfect for picnics and backyard parties all summer long! When you’re craving potato salad but want something a little bit healthier, this recipe is the solution! Swapping out half of the mayonnaise for yogurt reduces the calories and mashing half of the potatoes adds creaminess of the final dish, without having to add more mayonnaise. Use red potatoes in place of rainbow potatoes. Swap the pickles and pickle juice for capers and caper juice. Swap the yellow mustard for Dijon mustard. Add some diced red pepper. Place potatoes in a large pot of salted water and bring to a boil. Boil for 10-15 minutes, or until fork tender. Drain and set aside to cool. Meanwhile, in a small bowl, combine the yogurt, mayonnaise, mustard, 1 teaspoon dill, pinch of salt and pepper. Set aside. When potatoes are cool enough to handle, set aside half. Peel the other half by gently pinching the skin and pulling it away. Place peeled potatoes in a medium bowl and mash with a potato masher. Dice the remaining potatoes into 1-inch cubes and add to the bowl with the mashed potatoes. Add pickle, celery, 1/4 teaspoon salt, pepper, and all but 1 tablespoon of the green onion. Add the yogurt mixture and pickle juice to the potatoes and toss gently to evenly coat. Garnish with remaining dill and green onion. Wow!!! Totally delicious!!! Made tonight and man oh man!!! 5 stars all the way!! Made this last night – absolutely fabulous!!! Everyone love it and I will be sure to make this again and again. Thank you for an excellent recipe!! Oh my gosh this is amazing! Followed the recipe to the letter. It’s chilling right now in the fridge for dinner tonight?. Thanks so much because this is the fourth recipe from your site that I have tried and it has been a home run every time ? I made a triple batch of this for a 4th of July party and it was a big hit! I followed Cathy’s suggestions for cooking the potatoes (and eggs – not in original recipe) in the instant pot and they came out perfectly. I was raving all day about how easy it was to cook everything for this recipe. Other than the egg, I followed exactly as written and it was delicious! Everyone was tickled that it was ‘red, white and blue’ potatoes for the 4th. Potato salad is one of those things I would take with me if I had to live on a deserted island. It’s one of my favorite things, and something my grandmother made often for me. Cooking the potatoes in their jackets was always a pain to me. I steamed my potatoes in my Instant Pot along with 4 eggs; dice potatoes place in steamer basket, put whole egg in the shell on top of potatoes and add 1 1/2 cups of water, process on high pressure for 4 minutes and then quick release. Put the eggs in an ice water bath and put the potatoes in a large bowl or small rimmed baking sheet to cool. YUM! Thank you, thank you for your delicious recipes. I found you when I was doing weight watchers about 5 years ago and everything I have tried on your website has been a keeper. My whole family loves when I experiment with “new” recipes from you!! 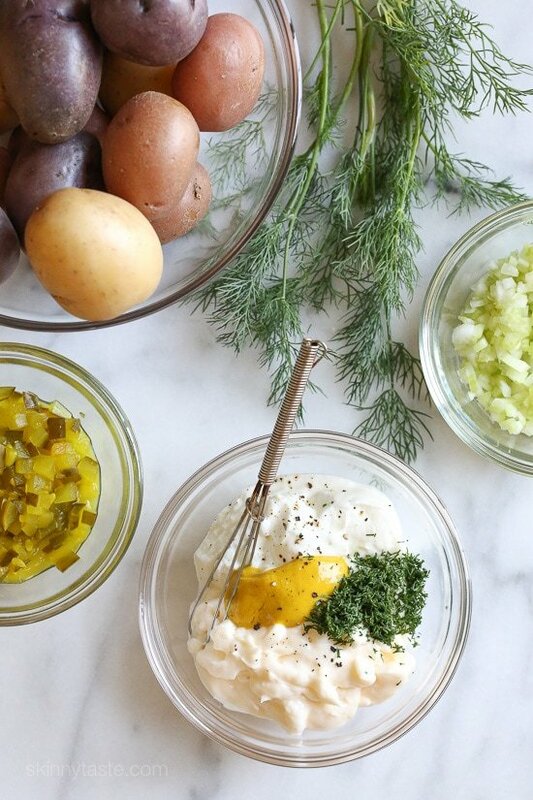 This potato salad recipe is almost identical to my regular potato salad recipe, but I LOVED the greek yogurt and fresh dill weed in it. Wow! I was also skeptical about mashing some of the potatoes but it turned out fantastic. 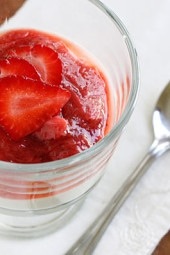 Will definitely be using these recipe tweaks from here on out! This potato salad was amazing. I love potato salad in general, and this one ranks only after my mother’s German potato salad. Delicious. Absolutely amazing! 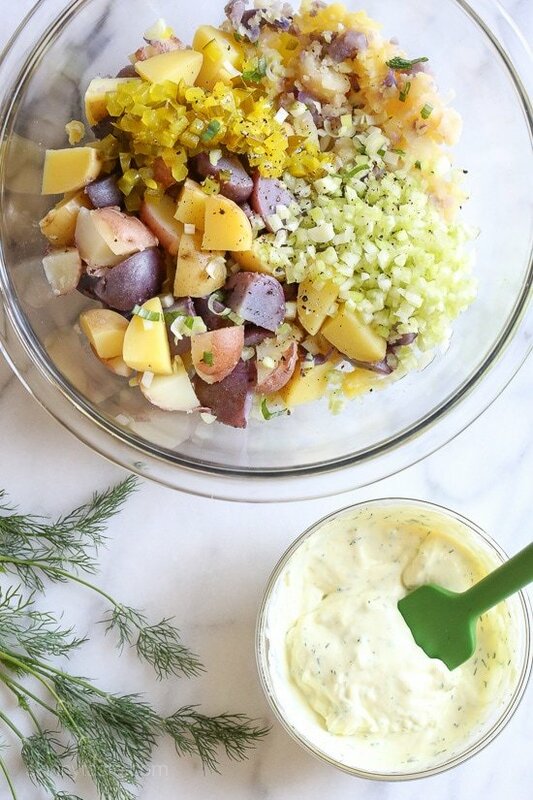 This potato salad does not taste skinny and I will be making it over and over again this summer. Thank you Gina for another amazing recipe!! Made this tonight it was GREAT! Used regular Hellmans Olive oil mayo so was 6sp for each of 6 good sized servings. Loved the little tangy crunch of pickles in this, would add more next time. Even picky non-potato-eater said it was good. Great recepie!! Absolutely delicious! It turned out a little too wet for my taste, so next time I would use less Mayo and save on points.The version I made is 6 points per serving because I used Fage 0 fat Greek Yogurt and regular Hellman’s Mayonnaise. I added a couple of hard boiled eggs and used 1/2 TBSP dried dill since I didn’t have any fresh. Just made this for our Memorial Day picnic. It was a hit and so delicious. From now on, this will be my go to potato salad recipe. Thank you, Gina for all the great recipes. Just made this for our Memorial Day picnic. It was a hit and so delicious. Thank you, Gina for all the great recipes. I’ve been looking for a light potato salad recipe and found it here. Yum! Glad you enjoyed it Barb! Going to make this salad this weekend in a triple batch for a baptism. Can this salad be made a day or two in advance? I think a day would be fine. This is so delicious I will never make another potato salad again. 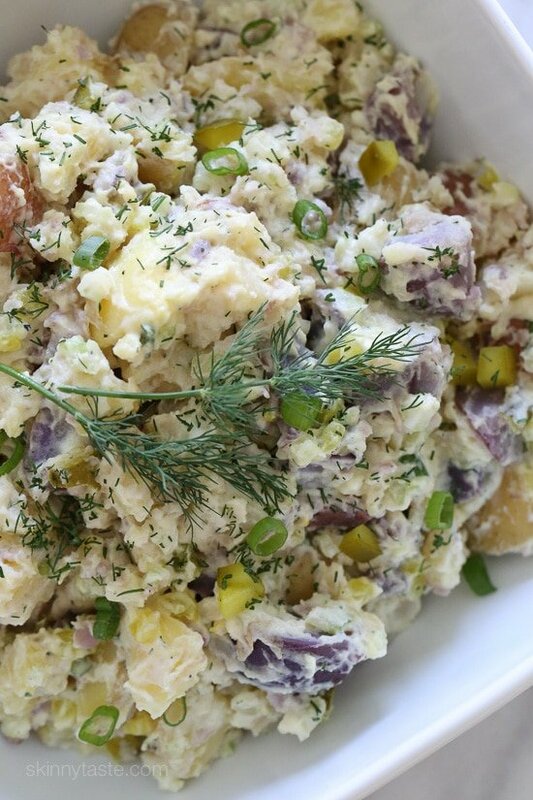 I love eggs in my potato salad but I really don’t miss it with this wonderful recipe!! Ahhh how did you know I was craving potato salad?? I can’t wait to make this. It has everything that I would like in a potato salad, but healthier! Perfect! My boyfriend doesn’t like potato salad because he doesn’t like mayo (or yogurt, actually), so I was going to wait until my cookout for my birthday at the end of August to make a potato salad. Buuut I really think he’ll change his mind after trying this one. And if not, more for me haha. 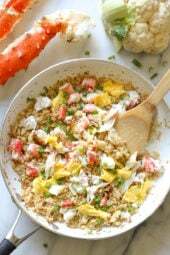 I LOVE potato salad and I love to tweek the recipes I come across. I like this recipe because it uses pickle and pickle juice which I have never added before, but I will now. Also, I add about a tablespoon of horseradish and instead of 1 tsp of yellow mustard, I use 1 tablespoon of dijon mustard. Sometimes I will add halved cherry tomatoes and/or green bell pepper for more color. All is yummy! 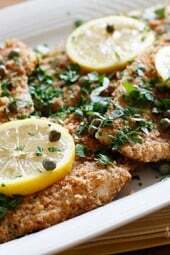 This is a fabulous recipe, I couldn’t wait to try it so I made it today. I didn’t have greek yogurt so I subbed in plain and I used large red potatoes diced into smaller pieces, I also diced up a red pepper for added texture. Delicious, I will definitely be making again! This salad looks great, going to try it this weekend!